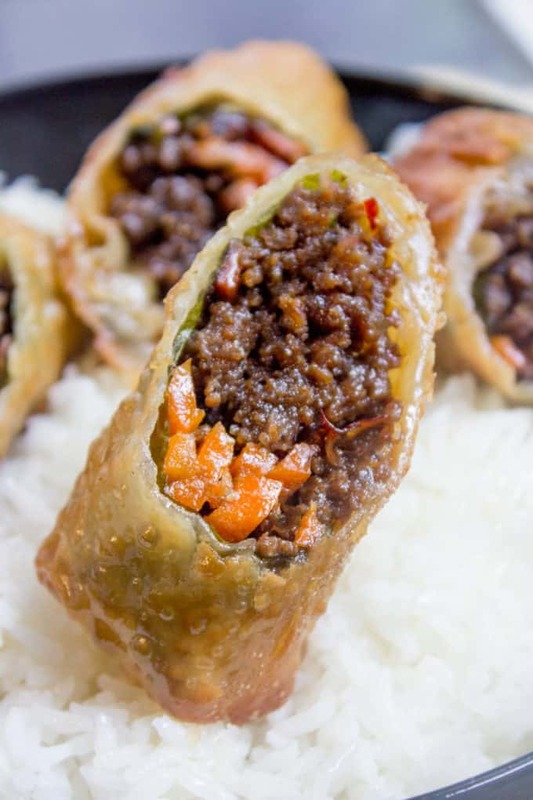 A Korean Egg Roll made with just ground beef, brown sugar, soy sauce, garlic, and ginger. Sweet and gingery with a soft center, these beef egg rolls are a-mazing! The perfect party food! 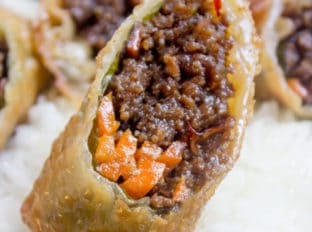 Korean Egg Roll with Ground Beef? Yes. Korean Ground Beef Egg Rolls weren’t originally on my list of recipes to make. Why you ask? Because I’d never heard of them. 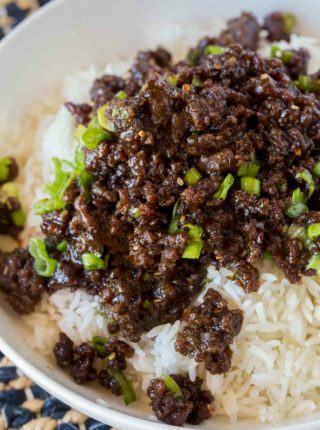 What I had heard of, and made before, was Korean Ground Beef which is one of our favorite shortcut meals to make with ground beef. So when I had about a cup of it left over and about a half a dozen egg roll wrappers I had one of those cartoon light bulb moments. Oh my goodness, yes. So many times yes. They were so easy to make and so good I used my second pack of ground beef I intended to make lasagna with to make a huge batch of these Korean egg rolls. I sent my husband (with both kids in tow…he is a saint!) to the store to buy two more packs of egg roll wrappers and just about an hour later I had wrapped and set to freeze 48 additional beef egg rolls. 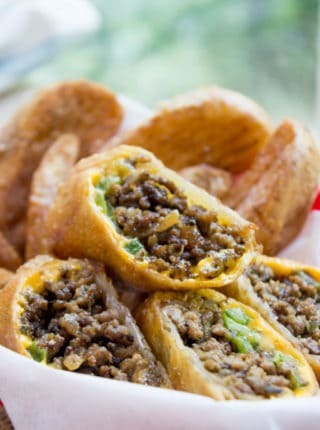 These Beef Egg Rolls are GOOOOD. The best part is these Korean beef egg rolls are different. They aren’t normal spring rolls or egg rolls. They are sweet and gingery and have a soft center with the carrots. There’s a hint of the slaw I normally make with Korean Ground Beef because I scooped the filling onto a small piece of napa cabbage to help prevent the liquid from soaking through the egg roll wrappers. I even added some matchstick carrot sticks to the pan I took the beef out of. I cooked them for a few minutes to soften them and added them to my newly concocted Korean egg roll. My Korean egg roll twist has officially been labeled “Second best egg rolls EVER” which is a pretty big compliment to them because I don’t know what could knock Cheesesteak Egg Rolls off the top spot for my husband. You can easily make these Korean egg rolls with the ground meat of your choice, I tend to serve them with a light salad with Miso dressing based on my favorite Costco Asian Salad Kit and creamy miso dressing. Korean Ground Beef Egg Rolls made with just a few ingredients are a great party food and perfect use of leftovers! I shallow fried them and they turned out great! Thanks for posting. I haven’t tested it before but if you decide to try, I’d love to know how it turns out! Thanks! How long do you freeze them? I usually make these ahead and freeze for later, but if you’re cooking the same day? Maybe a couple hours. If you freeze them with plenty of space around each one even an hour should be enough. Hope you love them! Made these yesterday. Instead of pieces of napa cabbage, I used pre-made cole slaw mix added more carrots. I flash froze them because there were a lot. Today I used my air fryer. They came out perfect. Thank you for the recipe. So glad you enjoyed it Candice! Could you freeze these without changing quality? I haven’t tested it as they always get eaten very quickly, haha, but I don’t see why not. Make sure to let them completely cool, wrap the in parchment paper and place into freezer bags. If you want them crispy after freezing, you’ll either want to place them in the oven or fry them again. If I don’t have cabbage could I use spinach or just eliminate it from the recipe? I’d just eliminate, the spinach may not have a great texture in the egg rolls. Steven F, I recommend you go back to school as well. Your grammar is perhaps more of an “epic failure”. Whether this is a genuine Korean recipe or not… the taste is far from a failure. Yum! Thanks Carrie, I ended up deleting his comment, I can handle if people try and dislike a recipe, but being rude for the sake of it is just not something I want on the page. I appreciate the support though! I’m really sorry this didn’t live up to your expectation but appreciate the feedback. I made this Korean ground beef egg rolls and my family loved it. Thanks for sharing it Sabrina. You’re welcome Lara! It’s great compliment when the whole family loves it! I made these for dinner last night. My husband loved them. They’re such a fun twist on traditional egg rolls. Thanks! So happy to hear he loved them! Thanks for coming back to let me know! Did not get 24 from this recipe. Got only 18 and i added bean sprous to beef them up and strech the meat. I bake mine instead of frying. Spray oil on the baking sheet and the egg rolls and bake at 425F for 18 minutes. Tried to subscribe kept getting an error message ? Oh no! I just switched email providers so I have been working through some kinks. I will make sure to add you manually this morning! Thank you for bringing the issue to my attention! These were a hit, a lot of work but well worth it. We used trader Joe’s sweet chili sauce as a dip. Very good! Awesome! thank you so much for coming back and letting me know how they turned out! These egg rolls were delicious. 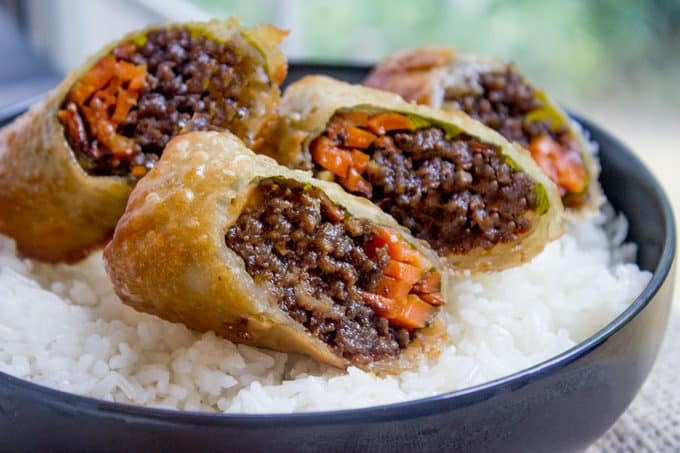 I have made egg rolls with chicken or pork and veggies for years, but never with ground beef. I had a half head of cabbage so used pieces of that rather than buying napa, and also added a handful of fresh green beans that needed to be used up. I cut them into match sticks and sautéed them with the carrots. Definitely a keeper recipe. Husband loved them. Is there a way to fry these in a pan in some oil or do they need to be deep fried? Do you think there is a way to bake them? With egg rolls you typically need them to deep fry, pan frying would lead to uneven cooking on the sides and it would taste a bit raw/chewy on the sides that didn’t fry enough. Great recipe, i air fry my egg rolls. 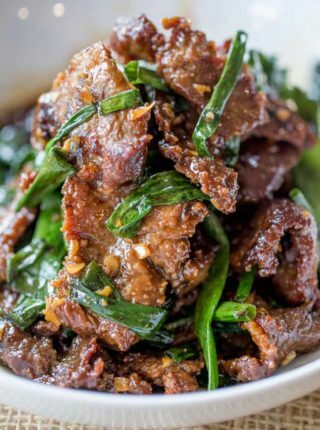 Same crispy crunchy taste, even cooking, less oil. is there a good dipping sauce for these you recommend or are they good on their own? Good on their own! But, sometimes we dip in spicy mayo (mix mayo and sriracha to taste). Either way they’re awesome. 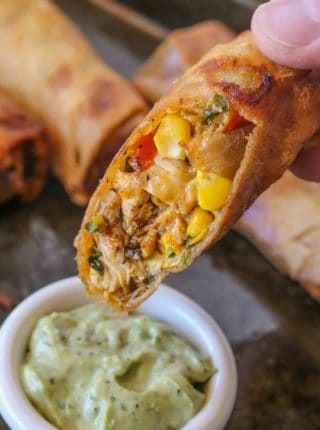 Such a great idea, and so different from a normal egg roll! 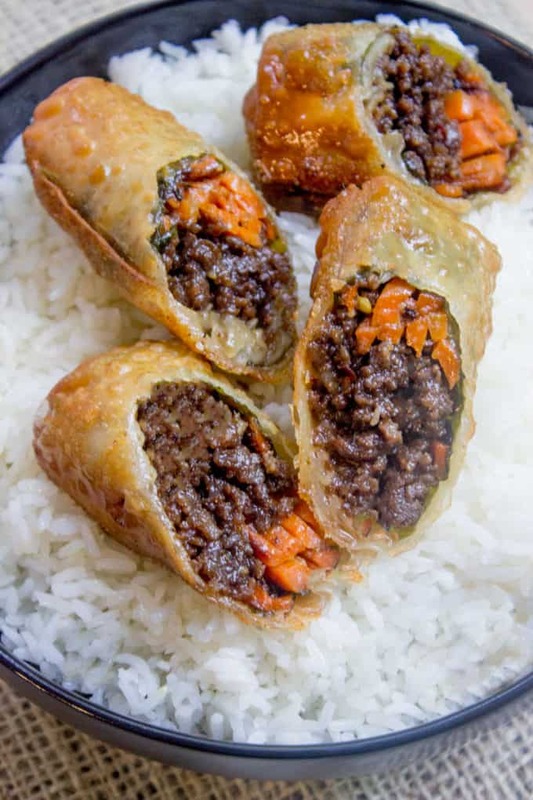 Now I have two new recipes to add to my list – Korean ground beef and these rolls!